Our latest download for you is for the 60th GRAMMY Awards. 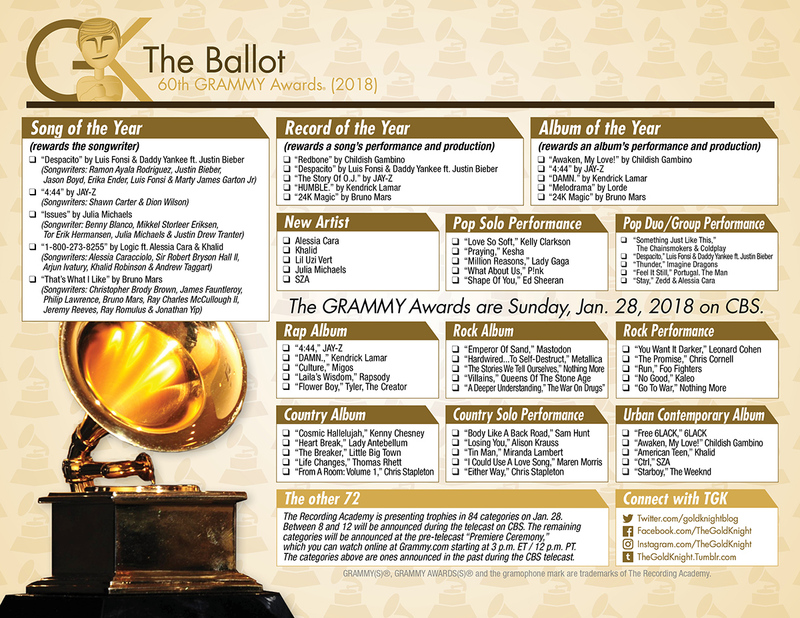 Find a selection of the nominees here in our handy GRAMMY Ballot. Download the ballot, print it out and pass out during your party. 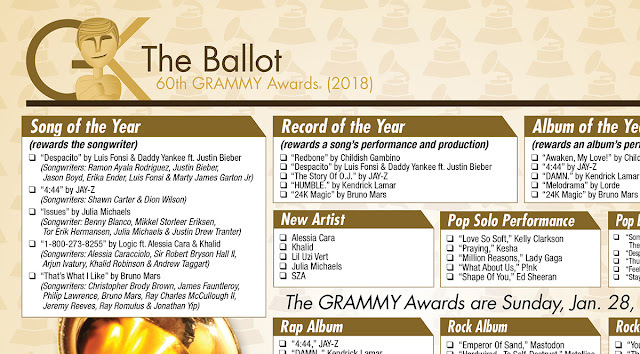 Our latest download for you is for the 60th GRAMMY Awards. 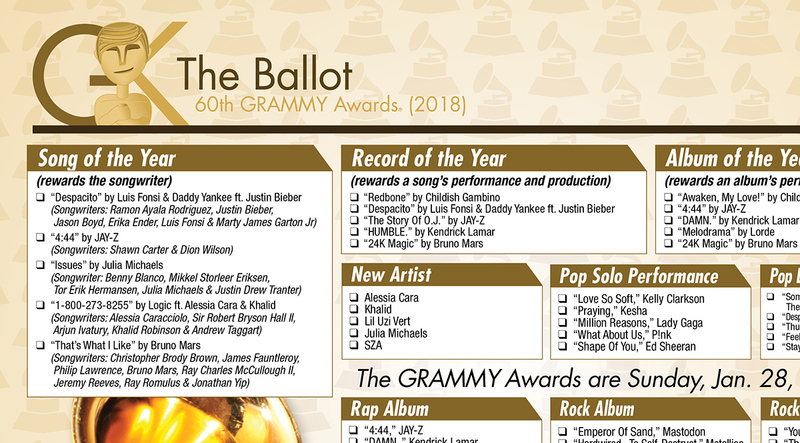 Find a selection of the nominees here in our handy GRAMMY Ballot. Download the ballot, print it out and pass out during your party (go here to download the updated PDF). It's in glorious color. We also have included definitions for Song, Record and Album of the Year because those categories can be confusing. The Recording Academy is preparing to present trophies in 84 categories on Sunday, Jan. 28 — from New York City, to celebrate the 60th anniversary. Between 8 and 12 categories will be announced during the telecast on CBS. The remaining categories will be announced at the pre-telecast "Premiere Ceremony." Watch it online at Grammy.com starting at 3 p.m. ET / 12 p.m. PT. When nominations were announced in November, Jay-Z led the field with 8 nominations (Beyoncé led nominations last year with 9), including Record of the Year ("The Story Of O.J. "), Song of the Year ("4:44") and Album of the Year ("4:44"). Jay-Z now has 74 Grammy nominations to his name and 21 wins. Kendrick Lamar earned seven nominations. He earned nominations in every category in the Rap Field, as well as for Record of the Year for "HUMBLE." Lamar is a seven-time winner and is now a 29-time nominee. The 60th Annual GRAMMY Awards will take place live on Sunday, Jan. 28 at Madison Square Garden in New York City and will be broadcast on CBS from 7:30–11 p.m. ET / 4:30–8 p.m. PT. James Corden is set to host for his second time.